There’s no stopping the remaster train, it seems, and even games that didn’t exactly set the world on fire on their initial release are being given a second chance. Today we have the eleven year-old 2000AD title, Rogue Trooper. Initially released in 2006, the original game on PS2 and Xbox was a decent cover-based shooter that did the comic it was based on justice, and delivered a pretty good game. Sales-wise, however, it came, sold a few, and went without much of a fanfare. Now, Rebellion is bringing Rogue back for current gen, an odd decision, indeed. Much like these fellas lack of body armour. For the unfamiliar amongst you, Rogue Trooper is a character from UK comic 2000AD, the same comic that stars the likes of Judge Dredd, ABC Warriors, Slaine, Nemesis the Warlock, and more. 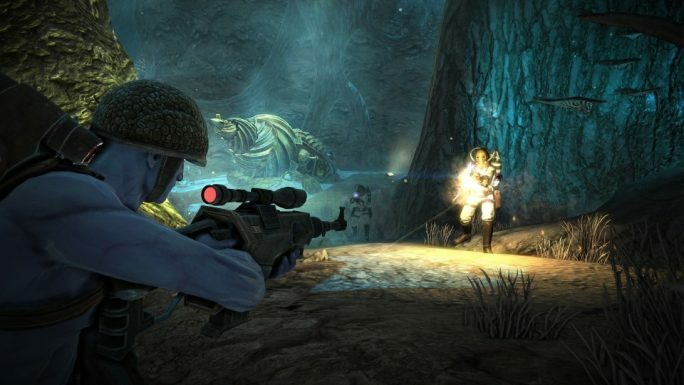 Rogue Trooper is one of the most popular characters of the comic, and one made for video games. Rogue is a GI (Genetic Infantryman) fighting a never-ending war on the planet of Nu Earth. This planet has been ravaged by chemical and nuclear war to the point the air is toxic, and the North and South armies in the conflict have to wear full life support suits to exist on the battlefield. This is not so for Rogue, who was genetically engineered by the Souther force to survive the toxic hell of Nu Earth, as well as to be a faster, stronger and better warrior. He’s one of an army of blue-skinned soldiers sent into combat. Unfortunately, Rogue and his fellow GIs were sold out by a Souther traitor, and all but Rogue were slaughtered in the Quartz Zone massacre. Only the biochips (circuits that preserve the minds and personalities of dead GIs) of Rogue’s squad – Helm, Gunnar, and Bagman – remain, now part of Rogue’s weapons and gear. His one goal is to locate and eliminate the traitor. This origin (which is true to the comics) sets the scene for a third person cover-shooter with stealth elements. As Rogue, you have to fight through linear, but open missions against the very Nazi-like North army. You know, the kind who just walk out of cover. If you think Gears of War, only a little more open and with a few extra tricks thanks to Rogue’s gadgets, you’ll understand how the game plays. For the most part, it’s run, gun, find cover, and take out waves of foes. Whilst you do this you can use Rogue’s various weapons, such as his assault rifle, sniper scope, rockets, hologram decoys, and even a remote sentry turret. As you progress you need to find and loot salvage from piles of scrap and from fallen foes. Using this, Bagman (who is now part of your bottomless, TARDIS-like backpack) can manufacture ammo, grenades, medkits, and other items, as well as upgrades. This leads to a shooter that, on harder difficulties, can also become a resource management challenge, as you have to conserve ammo and scour the area for salvage. It’s not all shooting, however, and there are stealth elements in play, with sneaky kills and the ability to use distractions and other tactics to deal with foes. Even 11 years later, it’s still a solid shooter at its core. The issues here, though, is the fact it’s been 11 years. 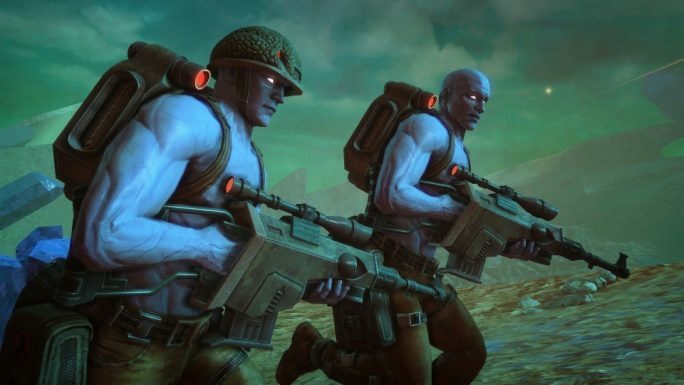 Times have changed, games have moved on, and Rogue Trooper hasn’t aged all that well. While it’s still a good game, there are many other titles that have improved the genre. Visually the game certainly looks better than ever, and as a long-time fan of 2000AD, I was impressed with the remaster actually altering the look of Rogue and many other elements to perfectly match the original comics. It’s clear fan service, and the attention to detail is great. That said, this is still no current gen title, and it shows, as the visuals are a far cry from current shooters, even with the touch ups. The controls are also more than a little dated, not benefiting from more up to date advances. It still plays like an 11-year old game much of the time, and when you’re experiencing it on a PS4, this doesn’t hold up particularly well, even with an improved cover system, and controls. When all’s said and done, what we have here is a game that’ll appeal to two groups of people only – 2000AD and Rogue Trooper fans who will appreciate the remaster’s visual change, and those who have yet to play the game. 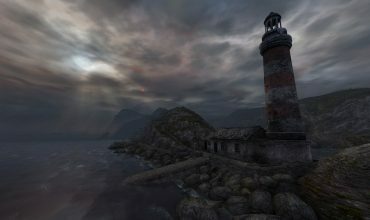 The latter group may find a fairly dates shooter, though, but one that still has its fair share of unique features, and the benefit of a great license. 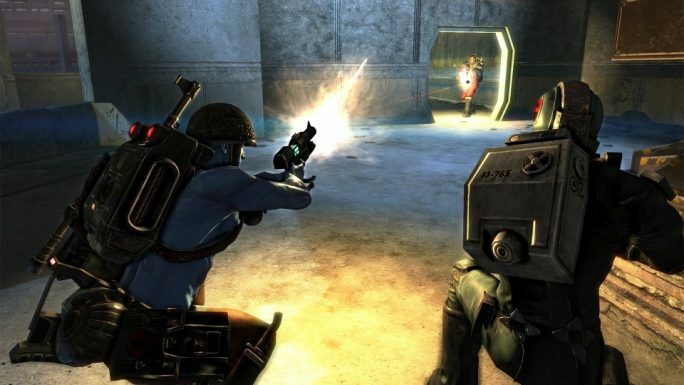 I was a fan of the original Rogue Trooper, and I must admit, I'm still partial to the game in remaster form, but taken as a game measured against modern title, it just doesn't hold up all that well. If you can accept the shortcomings, you'll still find a decent shooter, and thanks to the 2000AD license, one with plenty of character and style. Worth a shot.